New York, NY, April 4, 2019 - Seth Goldman, Co-Founder & TeaEO Emeritus of Honest Teaand Executive Chair of Beyond Meat will present Turning a Mission Driven Business into a Mainstream Revolution during his keynote talk to kick off all Saturday programming at Plant Based World Conference & Expo (PBW) taking place on June 8 at 9:00 am at the Javits Convention Center in New York City. 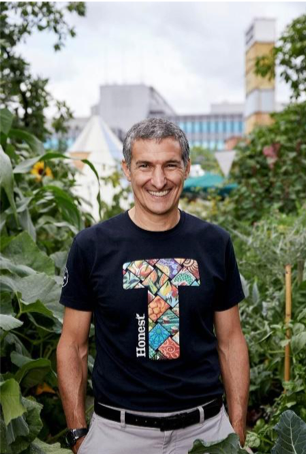 The keynote will be recorded during the live event and aired at a later date on the Eat For The Planet podcast hosted by Nil Zacharias, partners of the Eat for the Future Business Forum, taking place on Friday, June 7 and Saturday, June 8 during PBW. Click here for details on the full education program. "Seth's experience growing mission driven businesses into relevant players in the mainstream food industry is a perfect fit for the Plant Based World program,'' said Nil Zacharias, founder of Eat For The Planet and host of the podcast. "We are looking forward to hearing Seth's insights on what's next for Beyond Meat as they seek to redefine the meaning of meat, thoughts on the growing plant-based food industry and what innovative new food trends he expects to emerge in the decades ahead." Seth Goldman co-founded Honest Tea in 1998 with the goal of developing a less sweet iced tea back when organic, low sugar, fair trade and sustainability weren't buzzwords in the food industry. Seth believed in his mission and grew Honest Tea into a successful business, which was eventually acquired by Coca-Cola. Today, low-sugar beverages are in high demand among consumers and Honest Tea and Honest Kids are sold in more than 150,000 stores in the USA and Europe, including McDonald's, Wendy's, SUBWAY and Chick-fil-A. In 2015, Seth expanded his focus to change the future of protein by joining Beyond Meat, a plant-based meat company, as Executive Chair. Since the debut of the company's flagship product, the Beyond Burger, in May 2016, it has been sold in tens of thousands of grocery stores, including Safeway, Target, Kroger, Albertsons, and Whole Foods. Beyond Meat has also been added to menus in thousands of restaurants (including national food chains like TGI Fridays and Carl's Jr.), as well as a number of hotels, college dining halls, and even sports stadiums. Beyond Meat is also rapidly expanding distribution, as the company seeks to expand the availability and accessibility of plant-based protein. Seth also serves on the board of Ripple Foods, the Yale School of Management and Bethesda Green. The Plant Based World Conference & Expo will feature leading plant-based food industry companies like Founding Partner, Follow Your Heart; Gold Sponsors 22 Days Nutrition, No Evil Foods, and Good Catch Foods; and Silver Sponsors Daiya, Tofurky and Miyoko's Kitchen. Other Sponsors include Dr. Praeger's, Ingredion and Upton's Naturals. For more information, click here. Companies interested in exhibiting can contact Michelle Bonina, Sales & Business Development Director at 203-416-1924 or Michelle@theplantbasedworld.com. For more information about Plant Based World Conference & Expo, visit http://www.plantbasedworldexpo.com/.